Damage happens. Whether from frequent washing or from excessive styling, a damaged coat is a normal part of the show dogs' life. All damaged coats require treatment, but as you might have already learned, unfortunately not all products are created equal. When treating your dog's coat for dryness, split ends or breakage, it's important to reach for the best the first time around. Our selection of Premium SHOW products offer healthy deep conditioning without nasty buildup or residue. Don't weigh your dog's hair down with other products that promise results. Premium SHOW products only use high-quality ingredients proven to restore elasticity, shine and manageability. We never use chemicals linked to health concerns and use all-natural ingredients whenever possible. Don't currently use any conditioner for your dogs? A regular conditioner should be part of his normal bathing routine. Everyday conditioners add valuable nutrients to hair and promote strength, shine and manageability. After applying a conditioner, you'll find that your dog's hair brushes more easily and results in a more beautiful dry coat. Leave-in conditioners for dogs help to rebuild the coat from within and provide that extra bit of moisture your dog's coat might have been lacking. 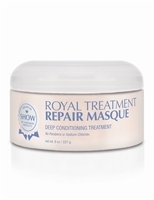 Have a question about one of our deep conditioners? Your dogs deserve the best and we're committed to providing you with quality products and quality answers. Contact us if you'd like to know more about the items you're about to purchase!